Progressive/Melodic Death Metal quintet FRACTAL GATES formed in France in 2007. 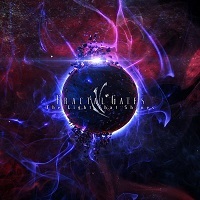 From their Facebook page, “FRACTAL GATES is alive because of the common passion of making catchy melodic metal music and writing about science fiction and personal development matters, no more no less!” Mixed and mastered by the famed Dan Swano, “The Light That Shines” is the band’s third full length album, and contains thirteen tracks. The lyrics focus on the future, our consciousness and self-awareness, the unknown, the magnificence of the universe, and the probable alien encounters we might be faced with. “Visions X” is a brief opening instrumental that sets the stage with sounds emanating from deep space. Twin guitar harmonies segue into the fast moving “Breath of Life.” Melodies abound, cut with powerful Death vocals. The Melodic Death metal sound is thick and full, as it should be, with a sophisticated sense of song crafting. “Chasing the Line” has a bit of a SCAR SYMMETRY vibe for me. The lead guitars dance effortlessly along the main chunky riffs, and provide a harmonic backdrop to the raging harsh vocals. This is how melody is done. “Infinity” is a short number with an energetic and infectious rush of adrenaline. It also pauses in a brief bridge section followed by an aerial display of lead guitar. “Bound by Time” is a slower song that uses a cautious riff with chord progressions that allow the melody to shine but without taking away from the heaviness of the track. Again, I can’t stop commenting on how the liberal use of thoughtful lead guitar really provides the glue to their sound. “Dreams Apart” goes a bit deeper into the spectrum, reaching the outer limits of the universe. Keys provide a notable ambiance that swirls with a majestic tone. Its alluring charm will tease you as much as the aggressiveness will excite you. “Visions XI” marks the beginning of the second half of the album…a short instrumental of keyboards and tender atmosphere. “Faceless” hits you hard with emotionally charged tones from the start. Melody is threaded throughout the song, woven tightly amidst the fervor of the vocals. Briquet holds down that bottom line on the kit as well as any seasoned drummer. It ends with a key change and a blanket of warmth. “Arise” is the shortest vocal track on the album, a three minute scorcher that burns deep with intensity and a suspenseful sound…visually akin to the rising of the Phoenix from the ashes. “Reborn” has a bit of an INSOMNIUM vice…that darker and gloomier side of the genre with regal overtones. The melodies are a little more subtle for the most part, allowing the weight of the song to shine. But towards the end a bridge springs up with some wonderful charming harmonies. “The Light that Shines” embraces a somewhat more accessible sound, with a mid-tempo riff that gets caught in your head, and a powerful rhythm that is augmented with light rays of melody that shine in the darker spaces. “Seas of Flames” is a near-six minute song; the final with vocals for the album. The vocals are especially gruff in this song, but the extended instrumental passages do just as much for the overall sound. It fades into the closing instrumental “Visions XII.” It sounds like the space craft that entered our world has decided to depart. As you watch in awe, it enters to clouds and disappears, leaving white noise in its wake. FRACTAL GATES have created a tight, dazzling and memorable display of Melodic Death Metal with “The Light that Shines.” A lack of clean vocals can sometimes make for a less than ideal amount of diversity in the genre, but not in this case. The commitment to the fierce Death vocals is tempered by pure beauty within subtle keyboard elements, and the sophisticated guitar work especially. Combined with the themes in the lyrics, this is an intelligent and exciting album that sticks with you. I daresay the genre is enjoying a re-birth lately, and FRACTAL GATES has to be mentioned as one of the forerunners.